My eyes opened to the universe of reading with the fairy tales. In different shapes and sizes all these stories from different corners of the world are an important brick in the foundation of my passion for reading. For certain, one of my cherished books will always be a certain heavy tome of fairy tales that I used to leaf through every time I got such a chance. Of course, with the passing of time these stories reveal in the fullest their true nature, a darker side and a not so pleasant face. But that didn’t work against them in the least, it only made them more appealing and the memory of them stronger. There is no wonder then that I have a very weak spot for the stories that reinterpret these fairy tales, adding them newer and darker twists. This September, a new opportunity to read such stories will arise when Jo Fletcher Books releases another fabulous project, an anthology, “Fearie Tales: Stories of the Grimm and Gruesome”, edited by Stephen Jones gathering brand new fairy tales or reinterpreting the familiar ones. After the excellent “A Book of Horrors”, the team formed by Stephen Jones and Jo Fletcher Books comes with another appealing collection, illustrated by the amazing artist Alan Lee, and with a very strong list of authors, this time their stories interspersed with the classic fairy tales that inspired the new stories, in an attempt to enchant the readers once again. Or to give them yet another fright. In 1884 Margaret Hunt's translation of the Brothers Grimm's Kinder-und Hausmärchen was published as Grimm's Household Tales—and since that day those stories have inspired writers, artists, poets, songwriters, playwrights and movie-makers the world over. Now, following in the grand tradition of the Brothers Jacob and Wilhelm, some of today's finest fantasy and horror writers have created their own brand-new fairy tales-but with a decidedly darker twist. Fearie Tales is a fantastical mix of spellbinding retellings of classic stories such as 'Cinderella', 'Rapunzel', 'Hansel and Gretel' and 'Rumpelstiltskin', amongst others, along with unsettling tales inspired by other childhood classics, all interspersed with the sources of their inspiration: the timeless stories first collected by the Brothers Grimm. 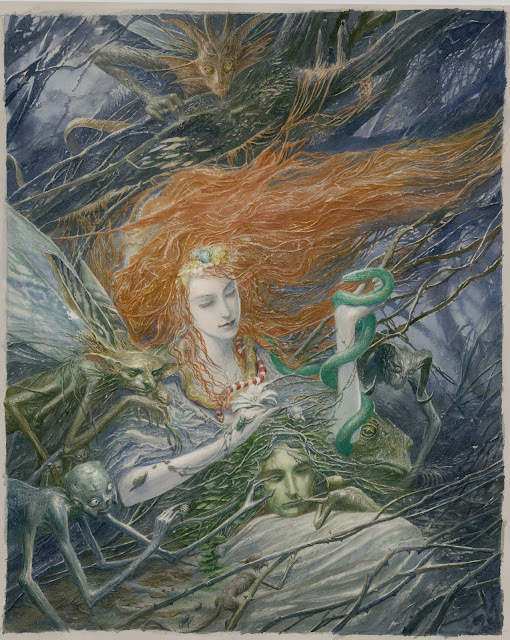 These modern materpieces of the macabre by Neil Gaiman, Garth Nix, Ramsey Campbell, Joanne Harris, Markus Heitz, John Ajvide Lindqvist, Angela Slatter, Michael Marshall Smith and many others, are illuminated by Oscar-winning artist Alan Lee, who has also provided the magnificent cover painting. But be warned: this stunning volume of frightening fables is definitely not suitable for children! Oh my gosh! You had me at 'Alan Lee'. So exciting.